The year 2006 has just ended, giving way to 2007. It gives me singular pleasure to take this opportunity to express profound thanks and appreciation to all those who have contributed in raising awareness to the Bakweri plight concerning the claim to their ancestral lands, and for the giant steps achieved in 2006. For the year which has just started, BLCC looks forward to participating in the negotiations prescribed by the African Human Rights Commission and endorsed by the Summit of the African Union. It is our firm hope that these negotiations which will be carried out under the auspices of the African Commission, wil resolve this century old dispute that has agonized the spirit of the Bakweri, once and for all. In wishing all our members and sympathizers a Happy New Year, be it remembered that the struggle to this point has sometimes encountered fearful odds. 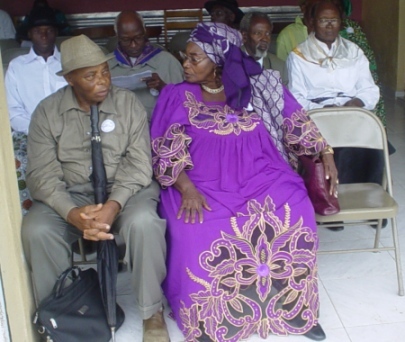 In April 2006, the BLCC organized a welcome home reception for Professor Ndiva Kofele-Kale, lead counsel for the Bakweri case before the African Human Rights Commission, in grateful appreciation for his meritorious services. News of the reception triggered a menacing death threat from the Fako Administration, but the reception went on regardless. The attached five prints captured some events during the reception, and are now being officialy released as souvenirs, with BLCC's best wishes for a happy New Year. BLCC Secretary-General in a pensive mood, gazing at a military truck with armed personnel, that was positioned outside the gates of the BLCC HQ. 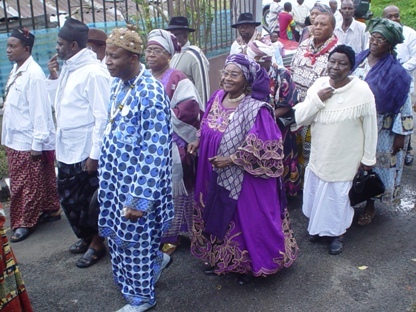 Professor Ndiva Kofele-Kale, sandwitched between Chiefs Molinge and Ekum, being escorted by a powerful delegation of Bakweri notables to the ceremonial grounds. 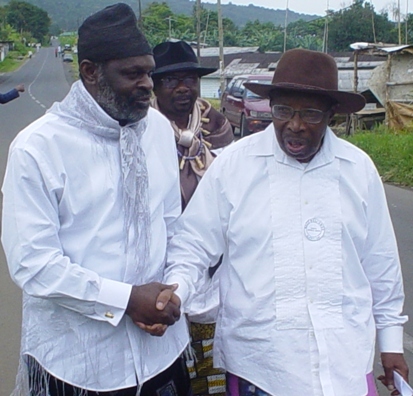 BLCC Secretary-General welcoming Professor Kale at the reception grounds, inspite of a death threat from the Fako Administration if the ceremony took place. The picture captures the defiant mood with which the Administrative banning order was treated. 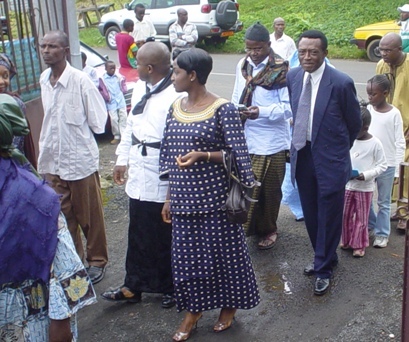 Some members of the Douala delegation arriving for the reception. 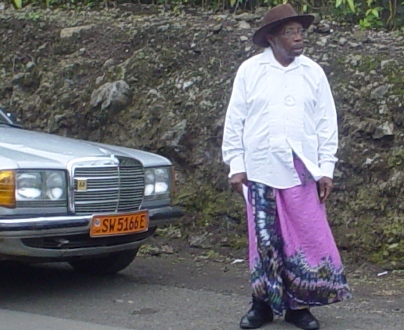 Mola Mbua Ndoko, who had arrived in battle dress, (as was Prince Ngale Monono) but had not had time to go home to change, being instructed in strict confidence by Iya Enang'a Ndando. This is a Flickr badge showing public photos from BLCC Pictures. Make your own badge here.